Brisbane, Nov 23: Determined to play the opening Ashes Test at the Gabba, Australia vice-captain David Warner, nursing a stiff neck, is considering adopting the unorthodox front-on stance of West Indian great Shivnarine Chanderpaul. 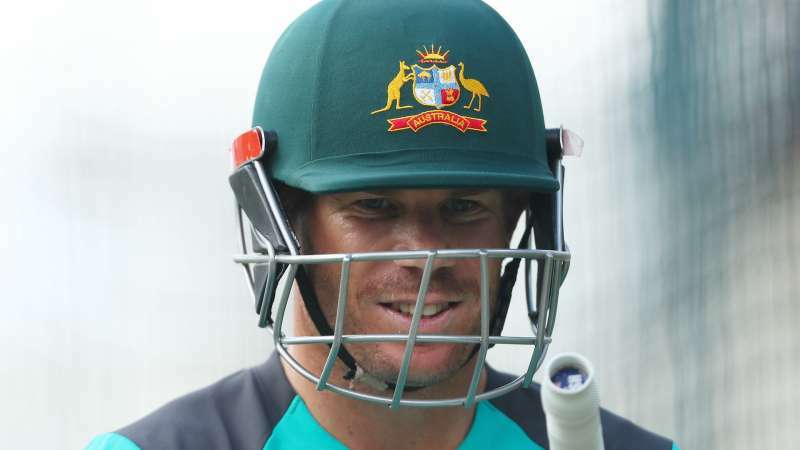 Warner, who twinged his neck while taking a high catch on the Gabba outfield on Tuesday, suggested light-heartedly that he could even emulate the Carribean southpaw's stance to make it to the playing XI. While all-rounder Glenn Maxwell was drafted in to the squad as a cover for Warner on the eve of the match, it looks highly unlikely that the southpaw will miss out on Thursday. Australia skipper Steven Smith on Wednesday said he had no doubt his vice-captain will be cleared to play. "Davey is going well. He had a hit just before and he's very confident. He said he'll be right to go," Smith said. On Warner's comment about adopting Chanderpaul's stance, Smith said: "He said he'll even bat like Shivnarine Chanderpaul if he has to and face the other way, so I think he'll be alright. "It's improved a fair bit over the last 24 hours. Hopefully he can keep improving and he'll be 100 percent come 10 o'clock in the morning," the skipper added. Warner had a 30-minute net session at the Gabba on Wednesday, facing some throwdowns from assistant coach John Davison.